This is a terrific photo. 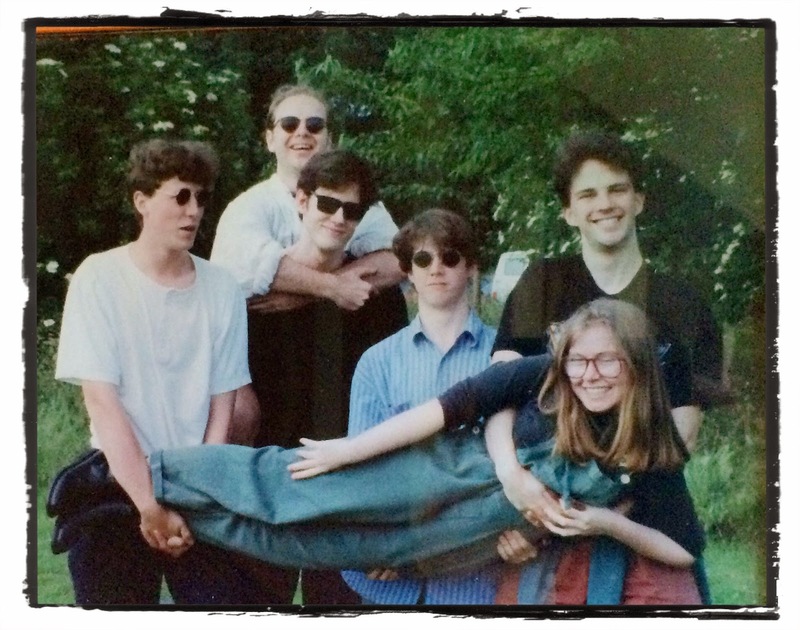 Taken a very long time ago, on a wonderful day when our band was at its best. We had a great time together and forged friendships that have lasted through the years. We made some great music. And some pretty ropey stuff too... And we worshipped with heart and soul. This last weekend some of us got to do it all over again. Ruth stood in for Carolyn, Richard B for Martin - M&C live in the US now, which is a bit far for a one-off gig. 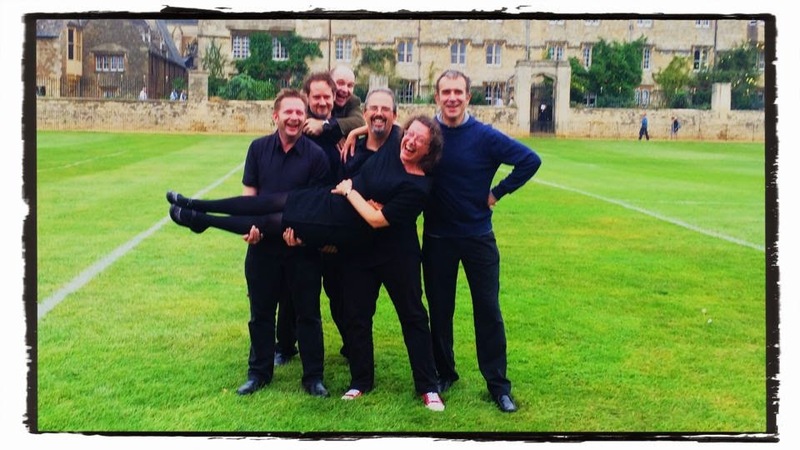 Both Ruth & Richard have played with us before: Ruth sang with us at M&C's wedding, and in the backing vocals on our last recording; Richard played bass on the last recording. And Chas got to play rhythm guitar in Neil's place, so Richard KH stepped in and completed the line-up. The Groove Heroes, back again. The Up from the Grave Heroes, disconcertingly sounding better than ever. I guess we have all been playing and singing for the last twenty years, so we ought to know what we are doing by now... And it's nice to know that Andy still churns out those creative ideas. (The ratio holds: one in a hundred is pure gold.) So (thanks to Andy) we ended up doing We are Marching in the Light of God (Siya Hamba) in the style of Pharrell's Happy. And it was terrific. Throw in some Rend Collective, and all sorts of other bits and pieces - we had a blast. 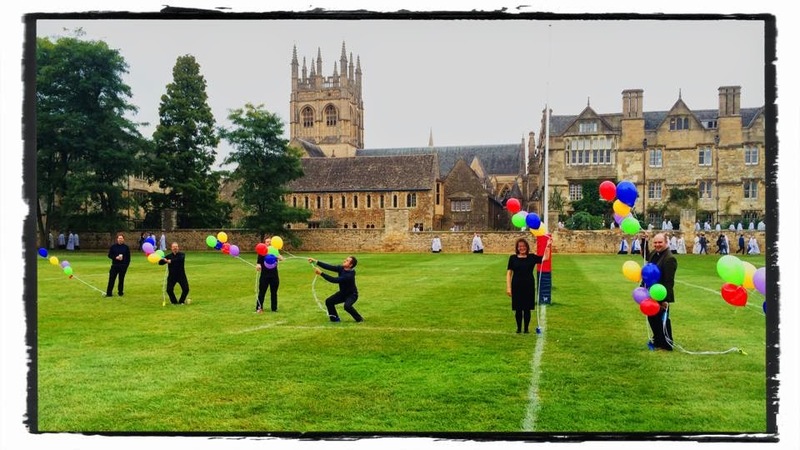 The event was the Oxford Diocese 'Grand Day Out', a huge farewell to Bishop John with a crowd of 2,500 and as well as the band we had a choir, an organist (Mr Paul Herrington, continuing the re-union theme) and a brass band. Occasionally all together. There are moments in life when you just get your breath taken away by the gift. I have felt that many things have been taken away, many dreams, many expectations over the years. And suddenly in the shadow of Merton College I was leading worship with this group of friends, including the choir and Paul H and brass band producing music that was rich and varied and with a host of bishops beside me, for a diocesan gathering at an important moment on a day when I would properly expect to be on the back row somewhere out of sight, out of mind - and I got to play and sing to Jesus and to invite everyone to hold my hand as I held his and join in the joy. You think you've let go of these things. Then comes the gift. Gift-wrapped on Merton field. At the end of the day, someone tapped me on the shoulder, and a serious, bespectacled, older chap looked at me and said: "As a bishop from Sweden, I want to say to you - Thank You For The Music".